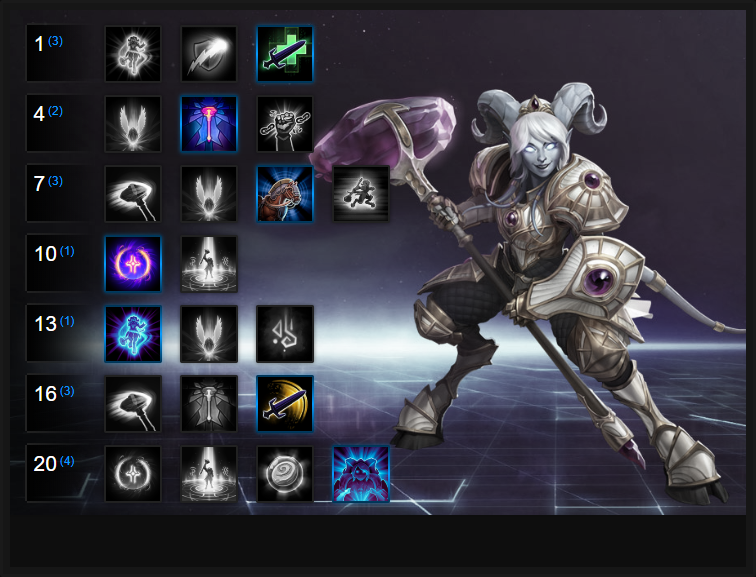 In this Yrel Build Guide, we provide an overview of her strengths, abilities, talents and matchups. Yrel is an odd Hero and one that I suspect - in the coming weeks - will see her kit adjusted, and her "numbers" buffed. She falls somewhere between Muradin and Johanna, in the sense that her kit is largely about disrupting the opposition and being a constant nuisance. While Yrel's damage is largely inconsequential, it's her access to high amounts of crowd countrol, combined with her self-mitigation and survivability that makes her valuable. While I doubt she'll ever be viable as a solo Warrior (honestly, she's just too slow), she's an effective solo laner and a brilliant bruiser. Alongside Muradin or Diablo she works exceptionally well at disrupting the enemy backline, and pursuing slowed targets. Unfortunately for Yrel, her movement penalty when channeling abilities, combined with her need to channel them, and lack of damage, sees her easily interrupted, and at times, easily ignored. That said, if you make use of bans effectively, Yrel can be strong in the right hands. Divine Purpose (Trait) - Divine Purpose allows Yrel to instantly trigger her next ability at maximum charge, without the need to channel it. What this does allow for is for her to chain her abilities, so that she can dive with Avenging Wrath before following up with a powerful Righteous Hammer. It's also worth noting - and as stated in the tooltip - that without triggering Divine Purpose, takes 1.5 seconds to charge. Fortunately, Divine Purpose has a low cooldown, ensuring you can use it regularly. Vindication (Q) - Providing Yrel with sustain and low AOE damage, Vindication allows Yrel to be a bit of a lane bully. Considering it works against minions, it allows her to soften a lane while ensuring she can out-last her opponent. When fully charged, the damage and healing are significantly increased, allowing Yrel to pressure and clear much better. Don't worry about overusing Vindication, its mana cost is low. Righteous Hammer (W) - Providing Yrel with a powerful knockback and stun when fully charged, Righteous Hammer should be used to peel, or push enemies into your team (after using Avenging Wrath behind them). With the ability only stunning when fully charged, it's often best used with Divine Purpose for a stun in a pinch. Just be aware that when fully charged, Righteous Hammer knocks enemies back further, denying you the ability to follow up with Avenging Wrath. Avenging Wrath (E) - Allowing Yrel the ability to leap to a targetted location, Avenging Wrath also offers a powerful stun. The main problem with Avenging Wrath however is the fact without it being charged, the distance is pitiful. For it to be used effectively, you have to charge it, or trigger Divine Purpose, to instantly gain the maximum distance. If you can, try to use Righteous Hammer immediately after landing - preferrably back towards your team - so that you can zone the enemy. Ardent Defender (R) - My preferred Heroic, simply because its level 20 upgrade is significant, Ardent Defender allows Yrel to gain even greater sustain than she already has. While it does mean that she needs to receive damage to actually gain any healing, the fact it absorbs all damage for 3 seconds does ensure she can survive most burst damage. Against heavy AOE compositions, or versus high single target (such as Fenix), it gives her a great deal of sustain. Sacred Ground (R) - Incredibly powerful when fighting on Objective heavy Battlegrounds, Sacred Ground works incredibly well on Towers of Doom or Volskya Industries. As long as she can fight over a specific location for a lengthy period of time, the 40 Armor is pretty outrageous and can make her incredibly difficult to kill. Maraad's Insight allows Yrel to become a solo lane monster. Allowing her to heal for a high amount after every ability, she can chain multiple heals back to back, as long as she completes an ability > basic attack rotation. With this Talent, I've yet to fight a Hero I can't win a lane against. Gift of the Naru lets Yrel heal a nearby ally who's low health when she triggers her Trait. The Talent scales well and allows her to releave some pressure from her Support. With the right timing, the Talent can also save a live near instantly, especially if she then dives to body-block or knock back. Whether it's a large Battleground or simply the need to rotate lanes/retreat quickly, Divine Steed offers Yrel the opportunity to instantly mount, and gain 80% movement speed. In a pinch it'll see you escape at amazing speeds. Variable: With Yrel suffering a fairly heavy movement penalty when channeling any ability, Samaara's Light helps to reduce this significantly. By giving Yrel 15% movement speed when above 50% health, she only moves 10% slower (instead of 25%). It helps her a great deal, and even when not channeling, ensures she can chase down enemies. If solo Warrior, pick up Ardent Defender. It's amazing for sustain and mitigating high amounts of damage, and it will save your life countless times over. Just be sure to use it when you've plenty of damage heading your way. Variable: On Battlegrounds that require Objective control, grab Sacred Ground. The 40 Armor when fighting in an area is amazing at ensuring you take very little damage. Particularly good on Volskya Foundry and Dragonshire. If you've taken Divine Purpose at 10, grab Aldor Peacekeeper. It ensures when you use Vindication enemies struck by it deal 30% less damage for 6 seconds. Combined with your armor, you can feel invincible. Variable: Yrel isn't mobile without Avenging Wrath, so having it slow by 25% more, and increasing its duration by 0.5 seconds longer (75% slow!) ensures high value targets can't escape. Repentance isn't mandatory, but it's amazing for locking down someone like Kael'thas. As a Warrior, Crowd Control is your nemesis (especially on Yrel). Gaining Unstoppable for 2 seconds, thanks to Seraphim, feels mandatory. These Hero Threat Levels (1 being lowest threat and 10 being highest threat) are to help you determine which enemy Heroes can give you a headache. For the Heroes listed here, take extra care as they're particularly dangerous for Yrel. This list of tips and tricks are just a handful of things we think will help your Yrel play. We'll continue to add to the list as required and if you have any tips you'd like to share, let us know in the comments below and we'll place them here. 1. Remember that you will always lose movement speed when using an ability, unless you trigger your Trait first. At which point, your next ability used will be at maximum charge. 2. In a pinch, use your Trait + Vindication for an instant heal, but be sure to be around as many enemies as possible. 3. Vindication gives you solid lane sustain, but it won't keep you permanently alive if you're careless, or don't use your Trait with it. 4. Righteous Hammer can be used immediately with your Trait to trigger its furthest knockback and stun. Use this after a fully charged Avenging Wrath to disrupt the backline. 5. Without charging your hammer, Righteous Hammer does little damage and knocks enemies back only the smallest distance. Ideally, try to always use it at fully charge. 6. The slow from Avenging Wrath only lasts one second. If you can, try to land the opposite side of an enemy to not only slow them, but also block their path. 7. Even without your Trait, it only takes a little over a second to fully charge Avenging Wrath. As long as you take this into account, escaping isn't difficult unless you're repeatedly hit with crowd control. 8. Yrel can withstand a great deal of punishment, so don't be afraid to dive. You can often escape with ease, all the while causing disruption. 9. If you've grabbed Ardent Defender, be sure to dive into a fight when it's active. You want to take as much damage as possible so that you gain health back. 10. When channeling any ability, be conscious of who you're facing and what crowd control they have. There's no use powering up Avenging Wrath to leap away, if you're stood next to Uther (who'll likely stun you instantly).